Blog » Health Blog » Health Implications Of Tattoo Removal: Is It Safe? In today’s world, a majority of the population have at least one tattoo on their body. Tattoos seem like a very good idea for people of a certain age. They come in varied designs, styles and colors which makes them appealing. Most people have admitted to the fact that they were not happy about their decision of getting a tattoo and have considered laser tattoo removal. In the medical world ‘medical therapeutic tattooing’ has been utilized as a camouflage technique in case of: vitiligo, breast areola reconstruction surgery, as a cover up in case of permanent hair loss after craniofacial surgery and also to hide the scars following a plastic or reconstructive surgery. Currently, there are a few requirements and regulations keeping in mind the safety of getting a tattoo. The sterility of the pigments and equipment is an uncertain situation and questionable. It is advised not get your tattoos done in makeshift tattoo parlors since it increases the chances of a skin disease or some sort of a skin reaction making the process of tattoo removal an impossible one. 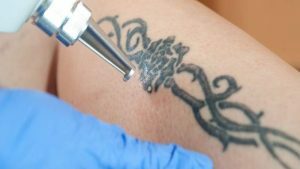 Some of the most common skin reactions related to tattoos and tattoo removal include acute inflammatory reaction, deep and local implications and infections, systemic infections, allergic contact dermatitis and photodermatitis on the tattooed area. There are other methods of tattoo removal like: dermabrasion and cryosurgery, but laser removal of a tattoo is most widely regarded as being the most effective method for tattoo removal. In this procedure, a laser is injected within the skin with the help of an intense light, which penetrates deeply into the skin and breaks up the ink particles making the tattoo fade, while the body’s immune system will get rid of these pigments over time. The laser that is used for this purpose is harmless and only targets the pigmented skin, leaving the rest of the skin unharmed. The breakdown of the tattooed area is done in multiple sessions and these sessions are decided depending on the size of the affected area. Tattoo removal is carried out with the help of Q-switched lasers which refers to the process of generating short laser pulses at the rate of nanoseconds. This is the safest and the most effective procedure for tattoo removal since it produces high-quality removal leaving behind little to no scarring. This also comes in handy for the removal of dark or brightly colored pigments which can be problematic under general circumstances. Usually a light hue is left after other tattoo removal procedures on the skin but in this case, no scars or hues are left behind. Also, read about: Does Tattoo Causes Skin Cancer. This cannot be completely eliminated but these side effects can be reduced by keeping the area clean, dry and completely covered. The skin pigment changes can make the affected area seem lighter or darker than its surrounding unaffected area. Before beginning the procedures make sure your technician is completely aware of your medical history and allergic background. This is done to ensure that you are not at risk of some auto-immune diseases like acne, diabetes and other skin related problems. The best way to reduce the risk of side effects caused due to this procedure starts by picking the right clinic and getting your procedure done with the help of a trained and experienced specialist. After each laser tattoo removal session, proper aftercare is necessary in order to prevent the side effects like skin infections, change in texture of the skin or other such unwanted skin changes. Refer to your healthcare provider for a proper aftercare routine schedule. A cold compress is advised in order to reduce inflammation and discomfort. Physical activities, hot showers and saunas are to be avoided for the next 24 hours. Direct sun exposure, pool water, salt water and hot tubs should also be avoided for the next week or two. Some scabbing, itching, light bleeding and some blistering may occur immediately after the treatment. Shaving in the treated area should also be avoided until it is completely and visibly healed which takes around five to ten days. Don’t use bronzers or self-tanners for the next 4 to 6 weeks prior to the treatment. In order to ensure you get proper treatment, you will need to find a reputable dermatologist who excels in this profession and this procedure in particular or a respected cosmetic surgery centre. In case you are confused and unable to find a reputable doctor for this refer to your primary healthcare provider for some reliable sources. These professional and reputed surgery centers and clinics follow the protocol that is required and necessary in case of a tattoo removal procedure. Here’s a comprehensive list of Skin Doctors in India. A successful tattoo removal procedure is a safe option for people looking to get rid of their permanent ink. Although it is a time taking and painful process when done properly, yields positive and appealing results. With a careful and extra aftercare regime the side effects can be easily avoided. One has to also take care of choosing the right and the appropriate medical care or clinic for their proper and careful laser removal procedure.